Today we welcome Daniel McInerny author of “The Bureau of Myths” a short story bring together Jane Austen and a bit of post-Apocalyptic distopian proper mayhem. Jane Austen is in a crucial way…the last great representative of the classical tradition of the virtues. This observation is from Alasdair MacIntyre in his book, After Virtue. In the circles of academic moral philosophy in which I, in a former life, used to lurk, MacIntyre’s book is arguably the most influential treatise of the last 30 years. But what does MacIntyre mean when he says that Austen is the last great representative of the classical tradition of the virtues? In a word, he means that Austen’s novels give us a vivid depiction of a form of community that was, even in Austen’s lifetime, disappearing from view in Western culture. This was a form of community devoted to a real common good, as opposed to a collection of common interests. It was a form of community in which parents were committed above all to forming their children in the virtues, a formation which included those manners we find both so strange and so captivating in the person of Mr. Knightley or in Fanny Price. Several contemporary books, movies, and television shows have played with the idea of a contemporary person returning to or somehow encountering Austen’s world or a world very much akin to it. The contrast between early 21st-century Western society and early 19th-century English society is so stark as to invite imaginative engagements between them. In my new short story, “The Bureau of Myths,” I imagine an even starker contrast between Austen’s world and a post-apocalyptic landscape in what we know as the Sonora Desert in the southwestern United States. What if, I wondered, in a bleak desert ruled by a harsh totalitarian government known only as the Regime, someone was to encounter a small, hidden community much like Meryton or Highbury or Mrs. Gaskell’s Cranford? And what if, I wondered further, this community came to be precisely because the people there had been influenced by the fragmented remains of Austen’s work, as well as by the work of Mrs. Gaskell and other writers who depict communities formed according to the classical tradition of the virtues? But who was this someone who encountered this community? I imagined a representative from the Regime’s Bureau of Myths, an office dedicated to ensuring that only government-approved stories are disseminated throughout the Regime. Here again my philosophical background was an inspiration. For it is Plato in his Republic who imagines a “perfectly just city” in which the work of most “poets,” including Homer, is banned because it does not comport with the city’s idea of what is conducive to formation in virtue. But what if my Regime clamped down on “myth-makers,” not out of concern for virtue, but out of concern for a way of life completely alien to anything like the virtuous community we find in Austen’s novels? 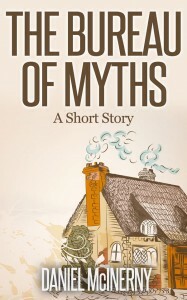 What my official from the Bureau of Myths finds in the village of Coombe Verde is unlike anything he has ever seen before. And the beautiful, lively young woman he meets there, Miss Jessie Brown, challenges him to decide whether the story he’s been told his entire life is a lie. I hope you’ll enjoy my story, “The Bureau of Myths.” You can find it on Amazon for just 99 cents by clicking here. It is also available at barnesandnoble.com. 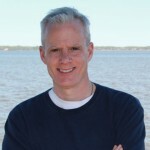 Daniel McInerny is a novelist, children’s author, playwright, and screenwriter. Find out more about him and his work at danielmcinerny.com.